In 2010 Head Lice was running rampant in our school district! The only options for parents seemed to be the harsh and toxic chemicals. Not only are they not good for the kids, especially if you have to apply over and over again, but sometimes they don't even work! Over time Lice develop a resistance to the chemicals. Feeling the need to do something about this problem, this mom became obsessed with finding another way to take care of the Lice. Utilizing my education and background as a Cosmetologist, I began researching and experimenting, and finally came up with a formula...our original "No More Lice Oil Treatment", and it worked! That was the beginning. Our product line has now grown to include handmade soaps, body butters, lotion bars, lip balms and more. They are all made from scratch, in small batches, using wholesome, natural and organic (whenever possible) ingredients. We even grow lots of our own herbs and flowers right here in our own backyard! Realizing that there are lots of people with chemical sensitivities, we make ours WITHOUT the use of Artificial Colors, Parabens, Sodium Laurel Sulfate, Phthlates, Petroleum Products or Mineral Oil. We offer a line that is 100% Natural, made with Pure Essential Oils, and another that is 95-98% Natural with high quality phthlate free fragrance oils. We make sure that the ingredients we use are sustainable, and NOT tested on animals ~ only on willing family and friends!! People often ask us "How did you come up with Butter Duck Farms?" 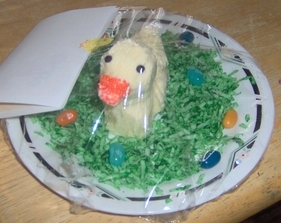 That Easter, in 2007, instead of our usual "butter lamb", I hand carved a "butter duck" and left it on Neal's front porch. The famous "Butter Duck" was the ice breaker for us, and the beginning of our story. When I started making soaps and other things, I asked Neal to help me come up with a name, and he suggested Butter Duck Farms. It was perfect. Where is your farm? Do you live on a farm? Neal and I both dream of someday having a "real" farm...with acres and acres of crops and lots of animals including goats, cows and lots of ducks and chickens! Until then, we live our little farm life in our Bolingbrook home and yard. We grow lots of our own organic fruits, vegetables and herbs, we can our vegetables, make jellies, compost and try to live a sustainable life. In 2002, I became a mom when I adopted my daughter Ana from Guatemala. In 2003, I quit my day job to work from home and raise my baby girl. Not long afterward, I was faced with raising her on my own, as a single mom. I was scared to death. I was blessed with a wonderful family, and my husband (who I met when Ana was 5) who support and believe in me, and allow me to continue to live my dream. It makes me so happy to hear back from happy customers telling me how much they love my products, and confirms to me that I chose the right path in life! Guatemalan adoptions have now pretty much been shut down, and there are many children living their lives in orphanages. We continually support El Amor de Patricia, a home for vulnerable children, with products and donations. 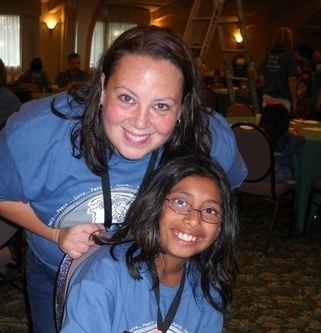 To be able to help these beautiful kids in Ana's home country warms my heart. A video story of a girl, her mom, and the company she built with love.